OK this one is already in theaters but it must be mentioned. Saw this movie last night so it will be biased, the trailer is ok but is does not do the movie justice at all. 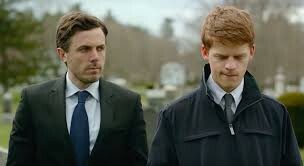 Casey Affleck loves doing movies about Boston so this fits that persona but do not think of this a typical Affleck Boston film. I think Casey legit as a shot to win the Oscar for Best Actor, he was that good. The movie overall is fantastic. It is a real movie about the struggles of loss and pain, it also hits the laughter button perfectly several times. You really feel it will all the characters, not just Affleck. Lucas Hedges has a breakout performance and stars along with Michelle Williams and Kyle Chandler who both excel in limited scenes. These are the kind of movies is really enjoy and putting it on my must watch list of 2017 (2016 but with limited release most will watch in 2017). Another movie that will problem receive some Oscar praise. This trailer is making its rounds, starring Denzel and Viola Davis. We know it is about an African American family in the 1950s and the struggles they face living together in America. They has picked the trailer scenes wisely because right of the bat we see the emotion from both Denzel and Davis. I wish they kept those scenes out the trailer. People will go see if the movie with the star cast so let us be surprised be the powerful scenes in the theater not on a computer watching a trailer. The first two trailers are hard hitting emotional movies, lets lightened it up with some hot women. Oh hello Emma Watson, if you know me then you know how I feel about little miss Emma. She can and will do no wrong in my book, she is the perfect actress to play Bell. We all know the story and how it ends but it will be interesting to see it brought to life in a new age. Emma will look stunning, duhh, but not sold on how good of a movie this will really be. Yup, I am pumped for the day after Thanksgiving when me, my mom and sisters head back to the world of Stars Hollow. It has been many years since we had a new Gilmore eps (yes I have watched all episodes at least twice). This time we get 4 new eps, one for each season to see how our girls are in their quiet little Connecticut town. Who are each of them dating? Will all past characters make an appearance (sounds like it!) Did Luke ever get a new hat? Things we hope to find out very soon!